Lakota moons did not follow today's 12-month calendar. Instead, the moons followed each season. Spring, summer and fall each had three moons, while winter had four. Blue moons happen once every 2.7 years, which explains why the last one happened on July 31, 2015. But despite their name, blue moons don't actually appear blue. A bluish tint is only possible when smoke or ash from a large fire or volcanic eruption gets into the atmosphere. These fine particles can scatter blue light and make the moon appear blue. The most recent supermoon happened this past New Year's Day, on Jan. 1, 2018. Because the upcoming full moon will be January's second full moon, it has earned the title of "blue moon." Finally, the last two events — the total lunar eclipse and the blood moon — are linked. A total lunar eclipse can happen only when the sun, Earth and full moon are perfectly lined up, in that order. With this alignment, the full moon is completely covered in Earth's shadow. January - Wiotekika Wi - Moon of Hard Times During this time of year, everyone experienced difficulties. Food was in short supply; the weather was fierce. Yet, the Lakota (Sioux) people prevailed. 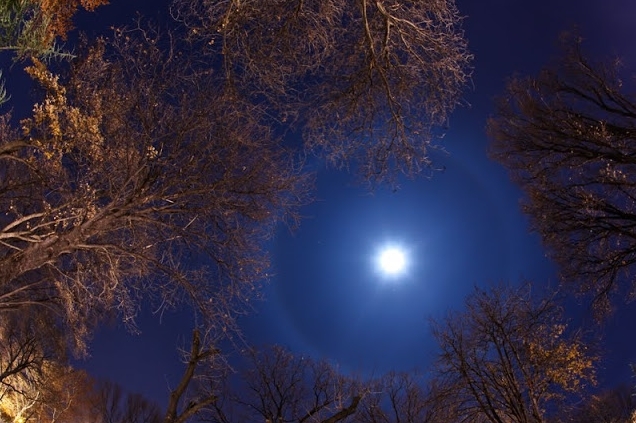 Responses to "Blue Super Moon With Halo Rises in South Dakota "